Dan Ayoub, executive producer of Halo: Combat Evolved Anniversary, spoke to nzherald.co.nz about what he called a joint effort between his team and Halo's global community of fans. How did it feel to bring Halo: Combat Evolved back into the modern day? It was fantastic. We say all the time this was really a labour of love. We describe it as a love letter to our fans because it's just something else to have a franchise that's still going strong 10 years later. It's just really hard to believe it's been that long. That's all because of the fans. The fans have supported it, and loved it, and enjoyed the franchise. This is something that they've been asking us for, for a tremendously long time. It's something that was kind of in the back of our heads, but I don't think anybody really got around to it. And when you do, you think: "Our 10-year anniversary is coming up, this is a game that really started it all. It's inspired pretty much every shooter that's come since. It's just changed the rules on so many levels. Our fans are still with us now, and we've got new ones that may have never played this in its original version. We've just really got to do this remake." It's something we are passionate about, it's something our fans are passionate about, and it just got to the point where we were like, "let's do this, let's jump in" and here we are. It feels great. There are so many first-person shooters hitting the shops right now. It's a pretty crowded holiday market right now. This is different on a few levels. This has always been a fan project, and giving them the big game they've been asking for. It's all been about reliving that nostalgia. At this time, there are $100 million marketing campaigns going on for some of these other projects. We are very much about making this about nostalgia and pricing it accordingly. I think that's the other thing. I'm not sure how the conversion works, but US$39 is fantastic, and there's a lot of value and features in there. What sets this apart is, this is really about just having fun, making it a thank-you for our fans and celebrating the 10-year anniversary at a price point that's really compelling, opposed to throwing $100m marketing campaigns in your face. People are familiar with Combat Evolved, so I guess you don't need to sell it twice? At the same time, we didn't want to do just another remake. They say it's the season of the big blockbuster right now, but it's also the season of the remake. A lot of big IPs, they're doing remakes and what we didn't want to do, was just do an HD version, because that was not going to be compelling enough. What we wanted to do was turn this into a big celebration and do something special, and that's where all these features came from. Obviously we've done the version in high-def, but we also have a slew of fantastic features between classic mode and 3D, Kinect, co-op over [Xbox] Live, and the terminals, to name just a few. The Halo universe has hosted plenty of talented writers. Who came up with the story for the terminals? We've got our franchise team internally. In particular, Frank O'Connor and Kevin Grace. We sat down with them and we drew out this long story, [and asked them] "what is this story we want to tell with the terminals?" It was Kevin Grace here at 343 who sat down and actually wrote those terminals. We worked with a very talented group up in Vancouver called the Sequence Group, who animated the story. It certainly exceeded our expectations. 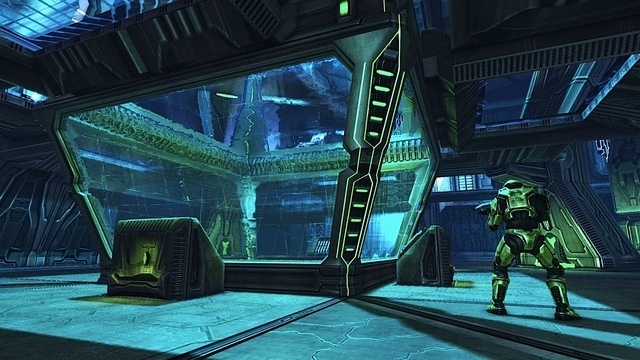 Our goal with the terminals was, if you recall how the terminals [in Halo 3] were generally just text on your screen, we really wanted to evolve that concept to the next level because the storytellers tell a much more engaging story if you can animate the screen. I'm glad people are loving it because we were blown away by how cool it was, and people have really locked on to that. You talked about a labour of love. Labour is a key word. How long did it take to complete the campaign overhaul? It's hard to pin an exact date on when we started but it was probably about an 18 month process from start to finish. It was incredibly challenging [and] we had very high ambitions for it. From the beginning, the development team set out to basically redefine what a remake could be, and shatter the expectation - that it doesn't have to be an HD thing, you can do some things to make it compelling. Because so much of the game was based around nostalgia, that classic mode became a big part of helping people to experience that nostalgia by letting them go back and see the game as it was 10 years ago. That was a very, very tricky technical challenge for us. Were you tempted to fix Combat Evolved's imperfections, or was the rule to leave it as it was? The rule from day one was to leave it as it was, but we did completely struggle with the temptation to change things sometimes. We finally got to the point where we just said this thing being exactly as you remember is the most important thing, to the point that I said "warts and all." We didn't even fix bugs that shipped in the original game because in many cases that became so core to that experience that we didn't want to change that. We absolutely had that temptation, at certain points, to do some changes and we just referred ourselves back to: this game must play exactly as it did 10 years ago. That became a great kind of stick to use on ourselves to make sure we stayed true to that. The interesting thing about it though, it created a challenge we didn't anticipate. When you're finalising the game and you're fixing bugs, we had to devise a system by which we'd say "okay, is this a new bug, or an old bug that we don't want to change?" It became somewhat tricky to make sure we didn't accidentally fix a bug that we were intentionally leaving in the game. I don't think we expected it. We just wanted to make sure we didn't fix any of those really popular bugs and exploits. Are you going to do Halo 2? It's really hard to say at this point. Obviously we're all aboutAnniversary right now and we're very excited, and we're very touched by how the fans are reacting. They're really grabbing onto this with open arms and I think it's because it's such a special game that's touched so many people. I always say we're doing 1 because the fans have been so vocal about asking for it, so who knows? If people start asking for it really vocally, who knows where we'll end up? Which Combat Evolved campaign level benefited the most from the overhaul? I think everyone has their preference. The interesting thing with the big, open areas, when you're outside and again I'll use The Silent Cartographer as an example, storming the beach, those very big, open areas are interesting to do the swap. But on a personal level, I found a lot of those interiors benefited the most because we have so much more processing power to throw at that, and you can do something pretty interesting. Keyes was a good one, and I think Pillar of Autumn was another great one that benefited pretty nicely from the overhaul. I think the entire game, obviously, has benefited. Another fun thing for me, for classic mode, I like to joke that it's 10 years of gaming evolution at the touch of a button, because you can just see how far our craft has come in 10 years. It's pretty humbling in many ways just to see, man, how far we've come. The Kinect features seem pretty sensible. Were there any ideas that didn't make it past the coffee table? We had a huge list for Kinect that we wanted to do. What actually turned into our cut for things like that was going back to that maxim of making sure the game played the same as it did 10 years ago, even in new mode, like the graphics might be better in new mode, but the gameplay's still the same? We just got to the point that like, "okay well, there was no Kinect 10 years ago and if we start doing Kinect things that change the gameplay then we're not being true to the soul of what this game is for our fans." We tried to focus on things that were complimentary without changing it, similar to our approach for 3D. When we decided to support 3D, we made the conscious decision not to include 3D in classic mode because that technology didn't exist 10 years ago. We were just very careful to make sure we didn't change that gameplay. Why use the Reach engine for Anniversary's multiplayer? The advantage of sticking with the Reach engine - obviously there's population once those maps are out there. The other one is all the great perks with come with Reach are now available to Anniversary, like [custom map tool] Forge and all those great modes that people like. The other thing that's really fun about is that armour abilities come with it. That changes a lot of how these old maps behave. The comparison I draw all the time is Beaver Creek, and how different it is to play that when people are flying over you with jetpacks, dropping grenades on you. It completely changes that experience. All of a sudden this old map that everybody's played a zillion times and loves, now feels really fresh and really different, yet still familiar to you at the same time. You can still play those levels without armour abilities if you still want to have that classic experience, but it's just so much fun to see how the gameplay has changed because those armour abilities have been thrown into the mix. Is this 343's way of getting its feet wet in the Halo universe and announce itself to the fans without taking a risk on a brand-new title? We've definitely always been around. Post-Bungie transition, this is our second outing. 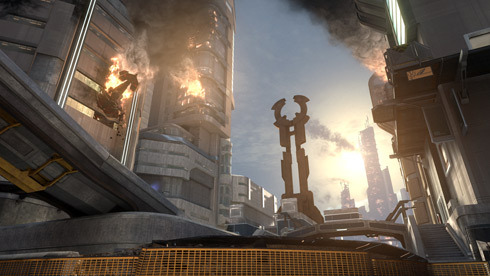 The first one was the Defiant map pack which was done entirely by 343 with Certain Affinity. Anniversary is the second thing that we've done as an internal unit and obviously Halo 4 is going to be the big outing. I'd love to say that was planned, crawl then walk, but that's really just the way it shook out. What's been great though is just to see the community react, and the people who are going to meet this transition with some skepticism. I think that's been great for us because we've been able to show them that we care about the community, we care what the community thinks. The community is the constant in this whole thing. They're still with us, they're still telling us what they want and we've been able to be responsive to it. Earlier on the development when we were talking about the audio, we remastered the weapon effects and the sound effects and all that, then we took the orchestral score and we worked with Skywalker Sound and we re-recorded it with a tremendous orchestra. People were very excited about that, but a lot of people said "it's really awesome, it's going to sound amazing, but it'll kind of be fun if we could still could have that old, classic music even though it's 10 years old and won't sound as good." We were at the point in the development where we said "let's do it, this game is for them," so we actually enabled that feature. We worked a little harder and made sure we got that feature in the game. It's just been a great experience for us to work with the community and let them see that we're listening. The 343 team has been pulled together from a variety of different developers. Is there a standing order to do as Bungie did? The soul of Halo always needs to remain intact. We've got some really talented people here at 343, we're very passionate about the franchise and I think are united by that passion of making Halo, continuing to be great and even better in the future. Hopefully that's a journey our community is prepared to take with us, because this is all about them. 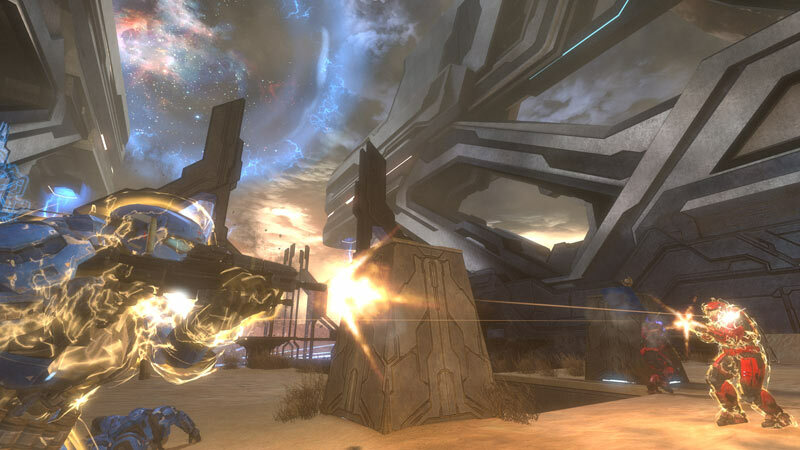 The expanded Halo universe, as told through the novels, is bigger than many gamers know about. How much might 343 bring that wealth of information into future Halo games? What's great about the Halo universe is, as you say, it's so big. What I love about it is, it never fails to show that anything is possible. We're always looking at that kind of stuff. It'd be interesting to see what other stories are told.